I think Men are infamously difficult to buy for….or at least I tend to find they are. My situation is not helped by the fact my husband’s birthday is the start of December, so I have to think up a second lot of presents within a month. Bad planning I think that was! 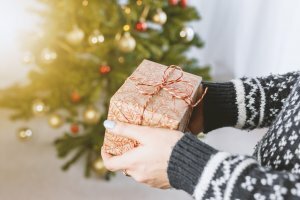 If you struggle to think up ideas of what to buy for the man, or men, in your life, here are a few suggestions. Every gamer who loves football has been eagerly awaiting the release of this game all year. Usually Fifa games just seem to update the team lists each year, but this time there are a load more new arcade-style modes to make the game a bit more interesting. From ‘No Rules’ where anything goes, to ‘Survival Mode’ where every time you score a goal, your opposition loses a player. The new modes could almost tempt me to play, and I really don’t do football games! Fifa 19 is available on all platforms . 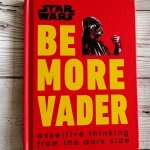 Star Wars: Be More Vader is a tongue in cheek guide to assertiveness. Whether your day-to-day work involves developing plans to build the Death Star, building a rebellion, or simply trying to make the printer work, the leaders of the Star Wars universe offer perfect examples of common professional pitfalls and how to deal with them assertively. 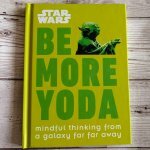 Along a similar vein, Star Wars: Be More Yoda is a great way of learning a bit of mindfulness, using wisdom from Yoda, Obi-Wan Kenobi and Luke Skywalker, this little book can help balance your mind, bring inner calm, and be a positive influence on the world. All things a Jedi needs to master the Force, and cope with every day stresses for those of us who have not yet mastered the force. Exploding Kittens is described as “a card game for people who are into kittens and explosions and laser beams and sometimes goats”. Exploding kittens is a card game version of Russian Roulette, but if you lose, a kitten explodes and kills you. It is the most-backed Kickstarter project ever, and this Not Safe For Work (NSFW) edition contains some fantastic artwork that is either too horrific/amazing to include in the original game. These four unique beers from Danish brewer Mikkeller are now available in M&S. They all have some pretty strange names; Stick a Finger in the Soil (Pale Ale, 4.6% abv), Hair in the Mailbox (India Pale Ale, 6.3% abv), Wood Will Fall Down (Passionfruit Berliner Weisse, 4.2% abv) and I Don’t Have Red Shrimp (Pilsner, 4.6% abv), and are full of flavour. 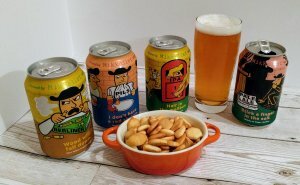 Perfect for any craft beer lover. One for the nostalgic, and those that don’t like water marks on their furniture! These Nintendo Nes Cartridge Coasters look exactly like the classic Nes cartridges they’ll remember, each double-sided coaster contains an image of one an iconic Nes game; The Legend of Zelda, Donkey Kong, Super Mario Bros. 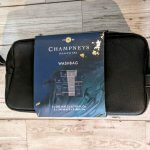 When I think of Champneys, I usually automatically think of women’s toiletries and gift sets. 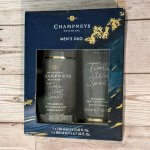 However, Champneys do some equally luxurious products. 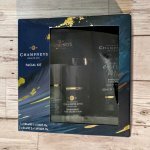 The Mens Relaxation Washbag containing Energising Hair and Body Wash, Rewarding Body Scrub, Energising Face Wash, and Energising Anti-Perspirant Deodorant is ideal for holidays, home, or business trips. The Mens Duo Kit is made up of Rewarding Hair and Body Wash, and Rewarding Anti-Perspirant Deodorant, in an energising citrus scent. The perfect way to start a day. The Facial Kit contains Energising Face Wash, Energising Post Shave Balm, Rewarding Moisture Balm, and a face cloth, helping to cleanse and smooth skin to he’s ready for anything the day throws at him. Don’t forget to check out my Toddler Christmas Gift Guide, as well as my Women’s Christmas Gift Guide.